China is the largest pork producing, and consuming, nation in the world - and with nearly 1.4 billion hungry mouths to feed - relies heavily on both backyard and commercial pork production to provide low cost protein. As with avian flu in poultry, China's pork producers have faced a number of disease challenges - including Porcine Reproductive and Respiratory Syndrome (PRRS), Porcine epidemic diarrhea (PED), Swine flu, and most recently porcine enteric alphacoronavirus [PEAV]. But the swine disease threat that keeps the pork industry up late at night is African Swine Fever (ASF), which - until now - has never been reported in China. That status changes today with the following announcement from China's Ministry of Agriculture of an outbreak in Liaoning Province, which borders North Korea. The news office of the Ministry of Agriculture and Rural Affairs was released on August 3, and a pig swine epidemic occurred in the Shenbei New District of Shenyang City, Liaoning Province. This is the first time that an African swine fever has occurred in China. On August 1st, a pig in a farmer in Shenbei New District, Shenyang City, Liaoning Province, was suspected of having an African swine fever, with 383 heads, 47 cases, and 47 deaths. Immediately after receiving the report, our department urgently guided the local authorities to take various prevention measures and sample and test. 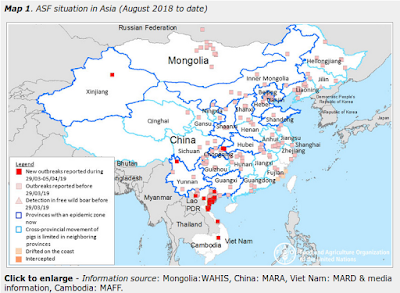 On August 3, it was confirmed by the China Center for Animal Health and Epidemiology (National Center for Animal Diseases Research) that the outbreak was an African swine fever. After the outbreak, the Ministry of Health launched a Level II emergency response in accordance with the Emergency Plan for African Swine Fever. In accordance with the requirements, the local government launched an emergency response mechanism and adopted measures such as blockade, culling, harmless treatment, disinfection, etc., prohibiting all pigs and susceptible animals and products from being transported into or out of the blockade area. Shenyang City has suspended the city-wide pigs. Transfer outside. At present, the epidemic has been effectively controlled. The Ministry of Agriculture and Rural Affairs pointed out that African swine fever is not a zoonotic disease, and the virus does not infect people. At the same time, remind pig producers to strictly transfer pigs from infected areas, pay attention to daily disinfection work, close pigs as close as possible, take isolation protection measures, avoid contact with wild boar, blunt soft palate, and prohibit use without high temperature treatment. The restaurant, the canteen of the canteen or the rest of the garbage are fed to the pigs. In the event of an abnormal increase in unexplained death and similar symptoms of swine fever, it should be reported to the local veterinary department. Although ASF doesn't pose a direct threat to human health, anything that significantly disrupts China's ability to feed their people is a threat to both the economy, and stability, of China - and by extension - the world. As a small example, late last year in Iran: Bird Flu, Food Insecurity & Civil Unrest, we looked at the societal impacts of a 40% increase in the cost of eggs and poultry in Iran. African Swine Fever (ASF) is a highly contagious, generalized disease of pigs caused by an Iridovirus of family Asfarviridae that exhibits varying virulence between strains and is very hardy to physical and chemical inactivation. The agent can remain viable for long periods in blood, faeces and tissues. It can also multiply in its vectors. In view of this, the control of ASF is dependent on stamping out policy and strict quarantine enforcement. It most commonly appears in the acute form as a haemorrhagic fever. Subacute and chronic forms of the disease also exist. Mortality is usually close to 100 percent and pigs of all ages are affected. The arrival of ASF to China has not been unexpected, as the virus has been making inroads in Eastern Europe and Russia the past few years. In March of this year the FAO released the following Rapid Risk Assessment. China is home to around half global hog population and the highest per capita consumption of pork and pork products (FAOSTAT, 2014). An incursion of ASF into China would therefore have devastating consequences for animal health, food safety, and food security, with the possibility of further spread to South East Asia and the Korean Peninsula. In this preliminary study, a qualitative rapid hazard identification is presented, including the evaluation of the different drivers conditions, or potential activities posibly playing a role in the introduction of ASF into China from infected countries. As further activity, a qualitative risk assessment was conducted to address various risk questions involving the potential entry of African Swine Fever Virus (ASFV), identification of risk pathways, the likelihood of exposure of domestic pigs to the virus, the potential further spread, and the persistence of the disease. In March 2017, ASF was reported in Irkutsk, Russian Federation, thousands of kilometres away from previously reported outbreaks and at approximately 1 000 km from the border with China. Entry of ASF into China would have devastating consequences for animal health, food safety, and food security, and raise the possibilityof further spread to Southeast Asia including the Korean Peninsula and Japan. The FAO rapid risk-assessment framework and methodology was discussed with swine disease experts attending the Second Regional Workshop on Swine Disease Control in Asia (China Workshop, 2017). The experts participating in this rapid risk assessment considered transport-associated routes (TARs) as most relevant pathways of ASF introduction into China, followed by illegal imports of food and by Chinese workers working abroad. China’s northeastern region (Heilongjiang province) is where ASF is most likely to be introduced, followed by Inner Mongolia. Wild boar population density is the most relevant factor in the spread of the disease. The most likely regions for ASF spread are the northeast (Heilongjiang), followed by the central eastern area (Henan, Shanxi, Ammui, and Hubbei) and the southeast (Hunan). Surveillance for swine diseases in this region should be heightened. ASF is most likely to persist and become endemic due to the presence of wild boar populations interacting with susceptible domestic species, and lack of biosecurity in smallholdings. However, due to restrictions on hunting in China, hunters are not likely to affect the spread and persistence of the disease. 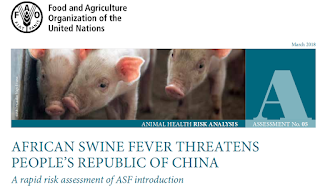 While not a zoonotic concern, ASF - should it spread widely in China - has the potential to cause significant harm to the health and security of billions of people throughout Asia.